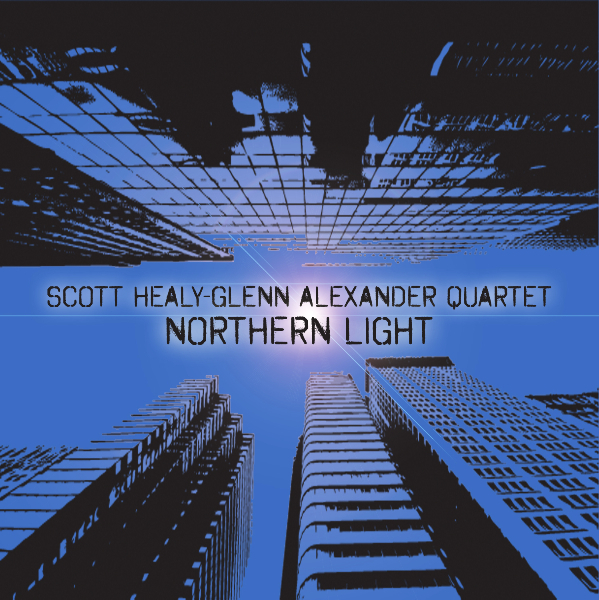 Twenty Years in the Vault: Scott Healy - Glenn Alexander Quartet "Northern Light"
For an album that has been stowed away in the vault for over twenty years Scott Healy and Glenn Alexander’s Northern Light has a taut, modern sound and sensibility. This enjoyable recording was taped by these two talented musicians back in December of 1991, along with the tight and elastic rhythm section of Kermit Driscoll on bass and Jeff Hirshfield on drums. You would be hard pressed to believe it isn’t a current offering. After this quartet disbanded, Alexander went on to some of his own projects playing with some prominent musicians in many genres, eventually landing a teaching gig first at the New School and then at Sarah Lawrence College in New York. Healy became full time pianist in the band on television’s Late Night with Conan O’Brien. As teachers often do, Alexander found a cassette of these ’91 sessions and played it for his students whose enthusiasm got both he and Healy to take another listen to what they had. They both agreed that the music not only held up well but possessed an extraordinary suppleness rarely captured on tape.They decided to release it on Hudson City Records in November of 2012. The music does have an organic quality to it, breathing at its own unhurried pace. The opening number “Spiral” is a case in point. Drummer Hirshfield seems to be able to let the fragmented tune float over a rhythm that has no appparent time. Instead the group sympathetically floats along a path created by Alexander’s meandering Abercrombie-inspired guitar excursions. On Alexander’s fetching “Christmas Day”, Healey plays a beautifully darting piano solo reminiscent of early Lyle Mays with Pat Metheny with Alexander’s guitar taking on a distinctive Metheny tone. Scott Healy’s “November” is introduced with a buoyant bass solo by Driscoll that leads to this folk inspired melody. Alexander plays a warm and sensitive acoustic guitar solo that helps sustain the “down home” feeling of this song. Healy’s piano work is beautifully conceived as he seems to lose himself in the solo with a Keith Jarrett-like wandering quality to his playing. On Glenn Alexander’s “To the Point” we have top notch ensemble work. Healy’s piano is poignant and pretty, while Alexander’s use of modulating echoed guitar effects is perfectly suited to the airy feel of the piece. Driscoll and Hirshfield are superbly understated while maintaining creative support. “Chimes” is a beautifully realized ethereal piece. With Hirshfield’s exquisite use of his cymbals, Driscoll’s sustained and bowed bass lines and Alexander’s masterfully controlled guitar work with its swooping violin-like sound. It is almost as if Healy is playing piano with his fellow musicians on top of a beautiful, open mountaintop meadow, the band in perfect harmony with its surroundings and the prevailing winds. “Chimes” has an open air freshness to it that transports you to that mountainside even when your sitting on the couch in your living room. The title track “Northern Light” has a 6/4 ostinato line that is played by Healy and with layered melodies by Alexander guitar and Driscoll’s bass before Healy adds his synthesized keyboards ala Zawinul at the midway point. Healy and Driscoll have a brief conversation with Hirshfield adding percussive pops along the way. Alexander lays low until he re-enters when Healy restores the ostinato piano line. The song seems to hint at worthy points of departure within its structure, but the promise never seems to materialize before the song ends. Scott Healy and Glenn Alexander’s “Northern Light” is one of those rare recordings that thankfully, after being buried for over twenty years, made its way out of the vault and into the light.